Many thanks to Amanda of www.ohamanda.com for hosting the Top Ten Tuesday every week. Visit her site to see all of the top tens for the week. They usually cover a variety of subjects and are very fun! 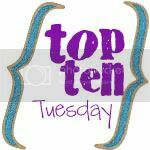 My Top Ten Tuesday is the top ten Reasons Chaperoning Teens is NOT a vacation. I have spent the last twenty years working with young people and I love them. I love every minute I spend with them but trips really cannot be called vacations! I have two children, not fifteen. I don't have my heart moved by watching their faith, their care for each other, and for our world. This list is made for the number of people who ask me upon returning from a youth trip, "How was your vacation?" I LOVE chaperoning young people but it cannot be mistaken for a vacation. With great thanks to the lovely Wasatch Presbyterian Church youth group from Salt Lake City, Utah for allowing me to spend time with them this week! Thanks for sharing your home with WPC youth and affirming the experience for all who have the privilege to share their journey.